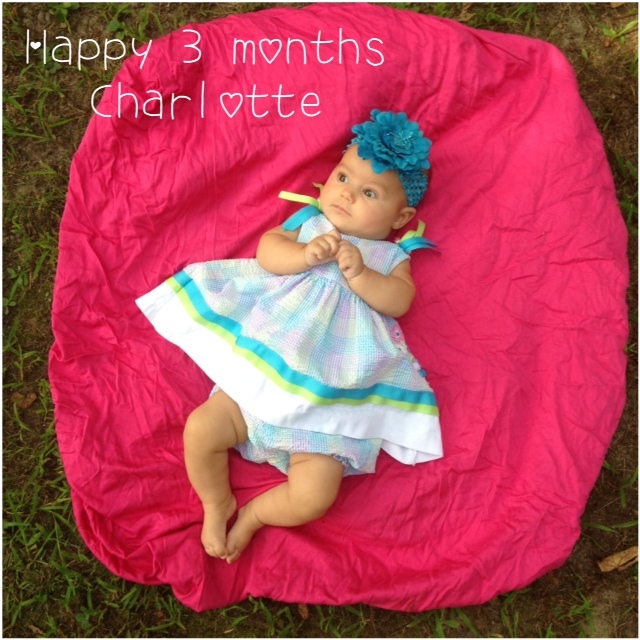 Can't believe our baby is 3 months old! It is so different every time I have a baby. And Char being our last, I think I am finally getting it. I will say it again, I am truly blessed to have these kids. Er.. rather WE are truly blessed to have these kids. Can't forget the husband. Sometimes thoughts of not having enough done creep in. Not enough work on the kids baby books done, not enough pics taken. Last night I remembered I never bought those monthly stickers to stick on Char's onesies for pictures. But this morning as my boys woke up excited about the cuz buzz at Nanas, their first thoughts were, "Oh my gosh, Char!" "Please can I hold her because I am leaving!" Mind you it is only 3 days that they will be missing. But, they all love their new little sister. More than pictures or written memories, I hope to remember what their faces looked like as they held her and told her they would see her in a few days. And they sang her Happy Birthday when she turned 3 months. And somehow it doesn't matter that I didn't catch up with those baby books and hey, I might not even remember what everyone's first word is (did I just admit that?). The love in this house is more than enough to make up for those things. And might I add it makes up for the dishes in the sink or the messy rooms- one which may or may not be mine? So when life gets a little hectic, I am trying to sit back and say, "Hey, I've got this!" And try to enjoy all the moments. As trite as it sounds, it all goes too fast. If you don't know already, we adore you!